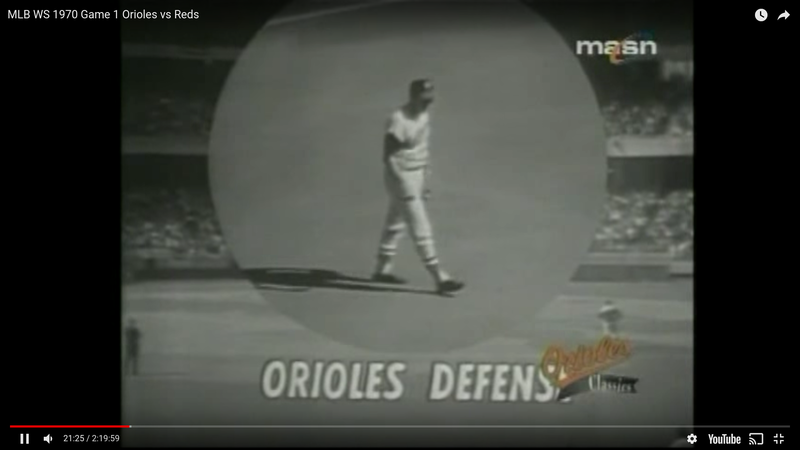 Although this World Series between the Baltimore Orioles and Cincinnati’s legendary “Big Red Machine” presented Robinson with a barrage of difficult Chances (Putouts + Assists + Errors), it was a mere microcosm of his entire career. 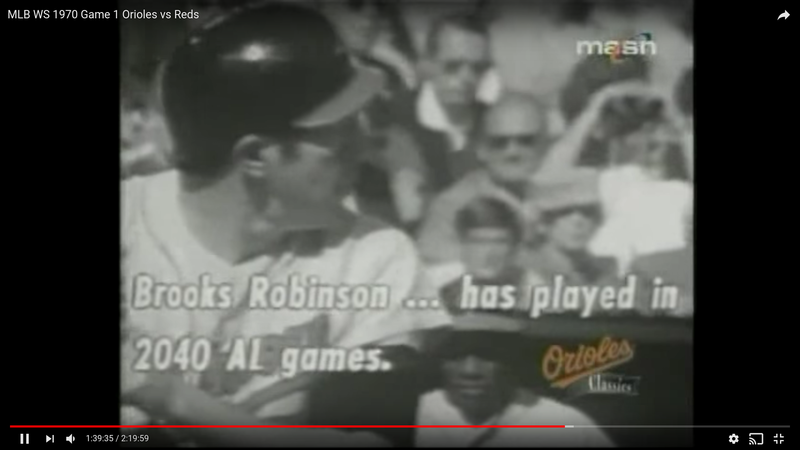 Instead of having the opportunity to make “one amazing play per game” (which is what seemed to happen in this Series), he would normally have the opportunity to make “one amazing play every few games,” but he made them – almost every time – for 16 (if not 23) years, and tens-of-thousands of Orioles fans, though excited about Robinson’s national publicity, merely shrugged their shoulders, and said, “Why don’t they already know?” This was nothing new to them, and even at age nine, it was nothing new to me: I regularly hustled home from elementary school to watch the Orioles and Robinson on a black-and-white TV set, whenever their afternoon games were televised on Channel 13. After reading the analysis of all five games, you just may be convinced that Brooks Robinson, as a defensive third-baseman, can no more be equaled than Johann Sebastian Bach or Leonardo da Vinci in their respective arts. Or, if the sensibility of comparing purely mental genius with a combination of mental-physical genius offends you, then make it Sviatislov Richter or Rudolf Nureyev – the point is that Robinson was *so* much better at the art of playing third base than anyone else, that the only legitimate comparisons you could make with players best-known for their offense, would be with Babe Ruth, Ty Cobb, or Ted Williams. No, not Pie Traynor, and no, not Mike Schmidt – remember I said this, because I’ll be discussing it more later. 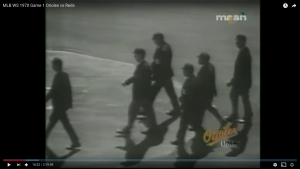 Of note: In 1969, the Chicago White Sox installed artificial turf, but other than away games at Comiskey Park in 1969 and 1970, this was the first time Robinson ever played an official game on the surface (there may have been exhibition games that I don’t know about, and I can’t imagine he didn’t prepare himself in advance somehow). 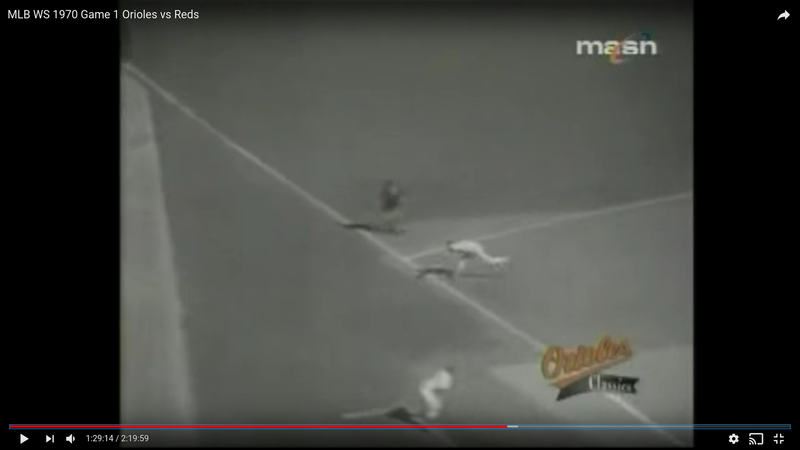 Here is the full video of Game One – you don’t need to watch the entire game, as I’ve done it for you, and I’m going to discuss every single play in which Robinson was involved – yes, even the high throw in Game 1 (he actually made two, arguably three, defensive mistakes in this World Series, with one of them being a bad strategic decision that couldn’t be ruled an error). Note that on the bottom-left of the screenshots (which you can click on and expand) is the time in the above film where the picture occurs, so you can go directly there and watch the video. More conveniently, if you click on the link labeled “Video of the play,” you’ll go right to it (on YouTube). The first time any proper noun is referenced (whether it’s a name or a place), a corresponding link to Wikipedia is provided. 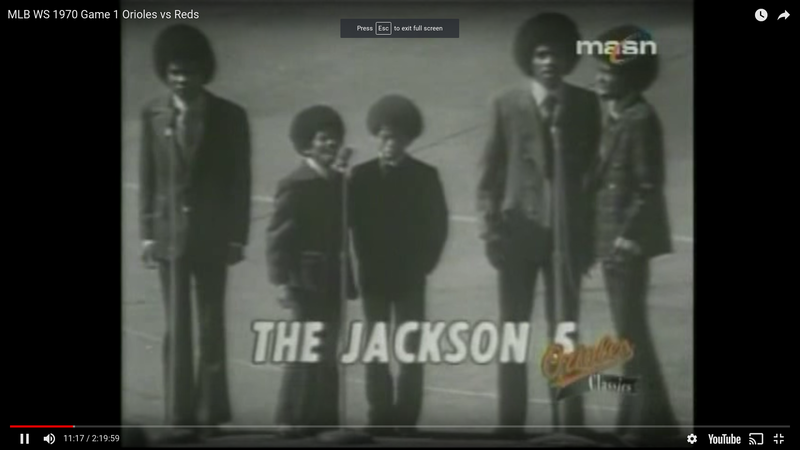 The series was broadcast on NBC, and was announced by Curt Gowdy, (Reds announcer) Jim McIntyre, and Tony Kubek. This would be the first World Series game in history that featured an umpire of color: the trailblazing umpire Emmett Ashford. 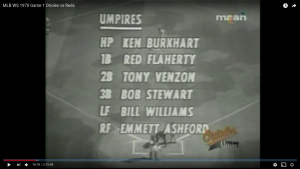 Although I could not find it here, an announcer reportedly said, in one of the game introductions: “Dignity, like cream, will always rise to the top” The following picture is historic, and Emmett Ashford should be in the Baseball Hall of Fame. 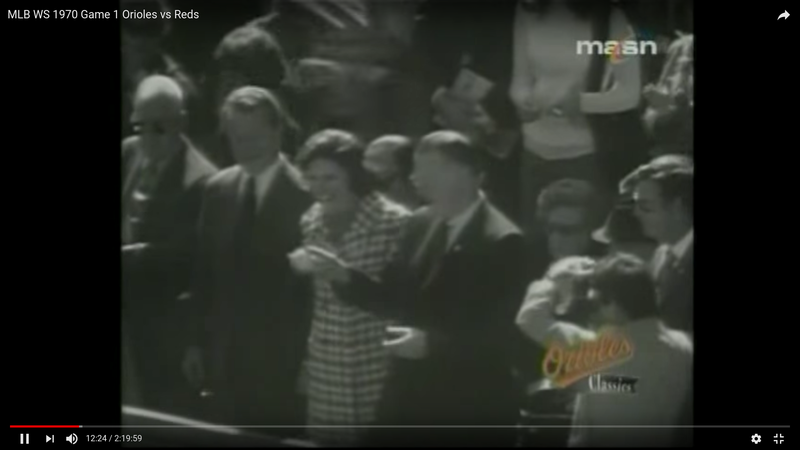 Baseball Commissioner Bowie Kuhn throws out two honorary baseballs. 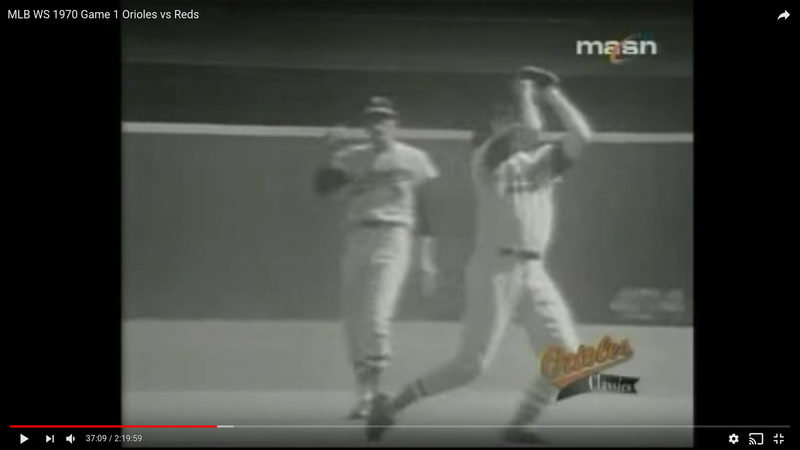 Bottom of the 1st, Reds leading 1-0, 2 out, runners on 1st and 2nd, Bernie Carbo at bat, 1-1 count – Very early on, there have been 3 hard-hit balls off of 20-game-winner Jim Palmer, and reliever Tom Phoebus was warming up in the bullpen. Carbo drills a hard line drive just to the right side of Robinson, who only needs to move one step. There’s nothing spectacular about this play, but notice how Robinson happened to be almost exactly where the ball was hit (by good fortune? 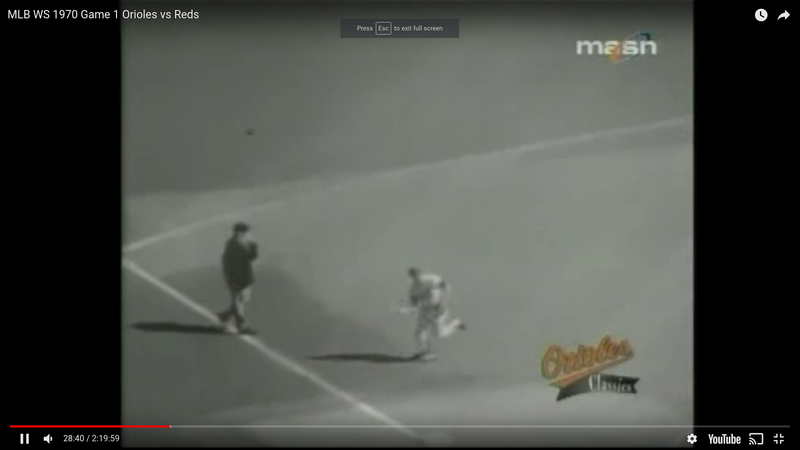 ), the soft hands (I’ll be bringing this up again), and the way he runs off the field without fanfare after flipping the ball to the pitcher’s mound, like he merely did what he’s being paid to do. There’s nothing spectacular about this play, or is there? 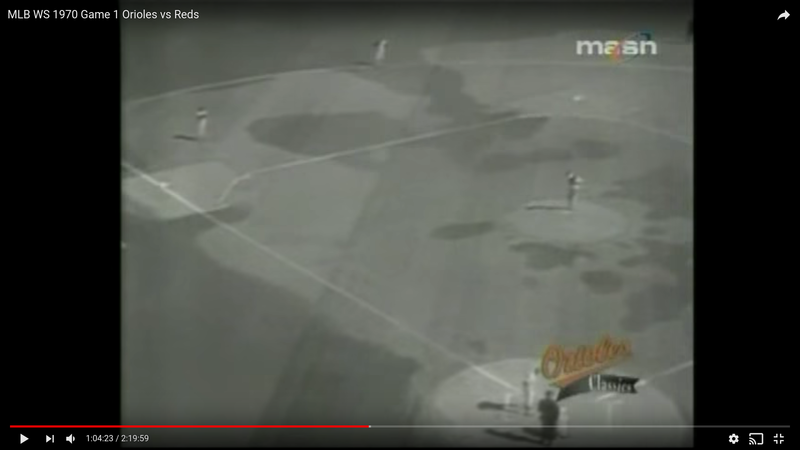 Look how close to 2nd base shortstop Mark Belanger was playing (he’s at the very top of the picture) – why was Robinson positioned relatively close to the line against the left-handed Carbo? Had he analyzed the specifics of the situation, did he know something in advance about Carbo, or was he merely protecting the line from an extra-base hit? If he had been two steps further away from the line, he would have needed to make a spectacular, diving catch to save two runs, and people would have been talking about the play for generations; instead, this looked like a routine out that was lost to anonymity. Video of the play. 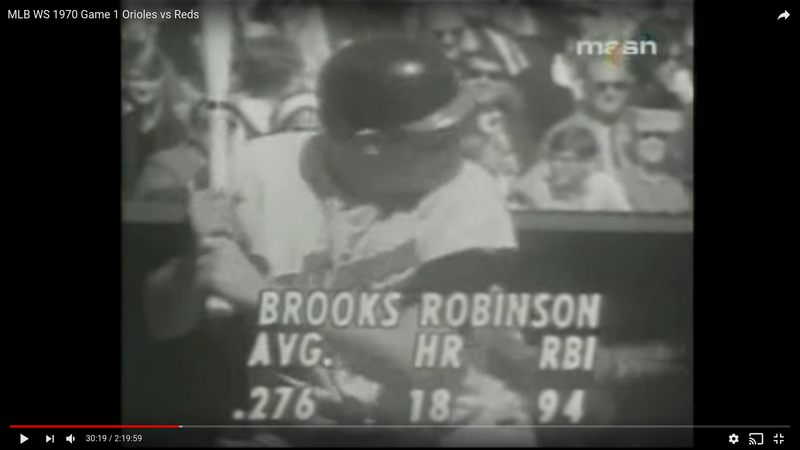 Top of the 2nd, Reds leading 1-0, 1 out, bases empty, Brooks Robinson in his first at-bat, 3-1 count. 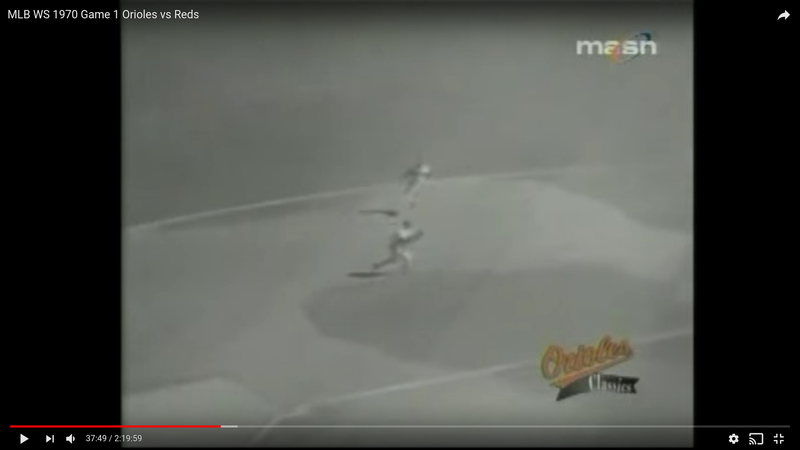 – Robinson hits a hard, topspin grounder to Reds third baseman Tony Perez, who makes a fine play, and easily throws out Robinson at 1st – although Robinson had cat-like reflexes, this play shows his lack of speed as a runner. 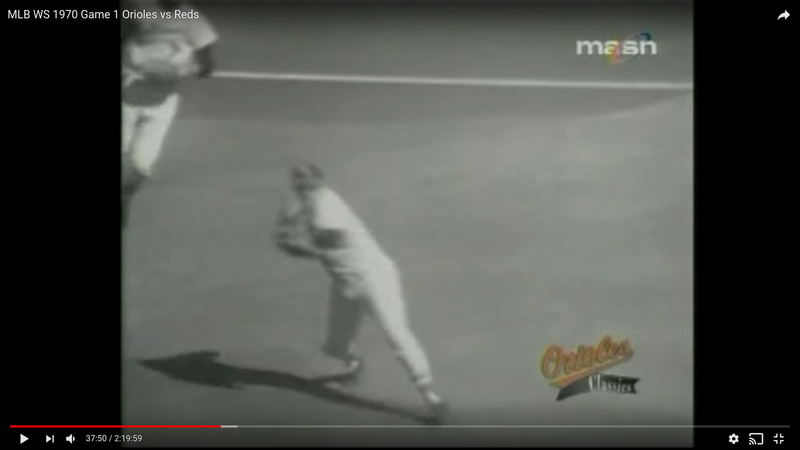 Notice also the good catch at first base by Lee May,: “The Big Bopper.” Throughout this Series, May will positively *pound* the ball, nearly always pulling it – I cannot recall another World Series when any one player hit the ball so consistently hard. Video of the play. 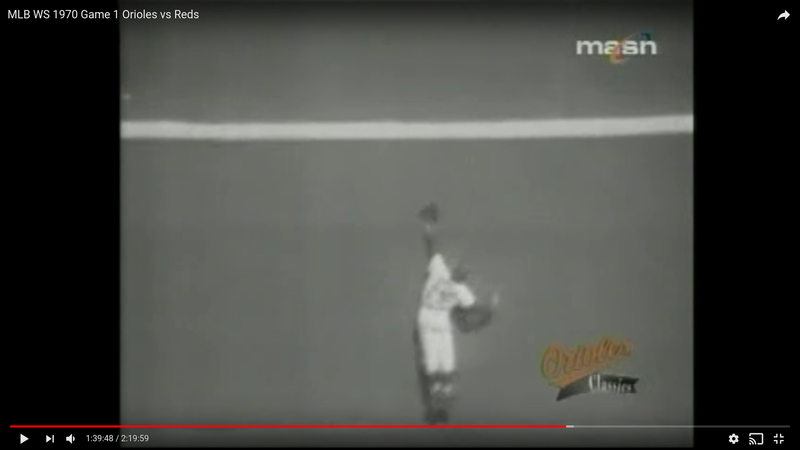 Bottom of the 2nd, Reds leading 1-0, none out, bases empty, Tommy Helms at bat, 1-1 count – Helms hits a sky-high pop-up to Robinson, who calls for the ball, puts his glove in the air to keep the sun out of his eyes (notice the shadow), and then finishes the fairly routine play. Video of the play. 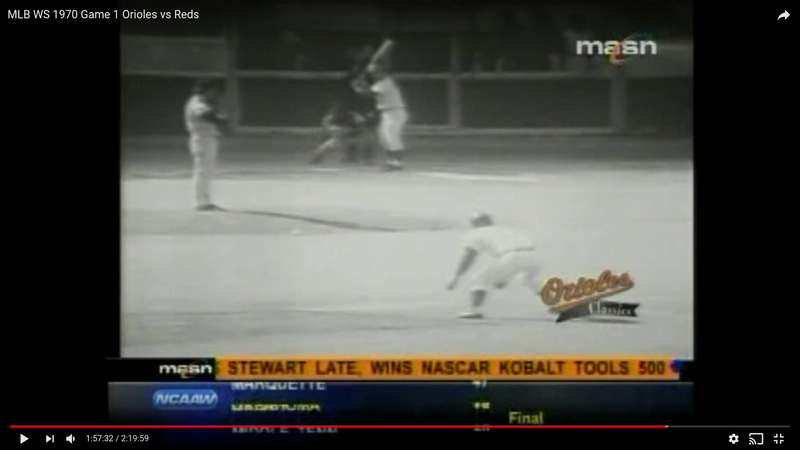 Bottom of the 2nd, Reds leading 1-0, 1 out, bases empty, Woody Woodward at bat, 1-0 count – Woodward, choking up, hits a slow chop to shortstop, which Robinson cuts off as usual, and then inexplicably throws high to first, forcing Boog Powell to jump up, and allowing Woodward to touch the base before Powell lands. 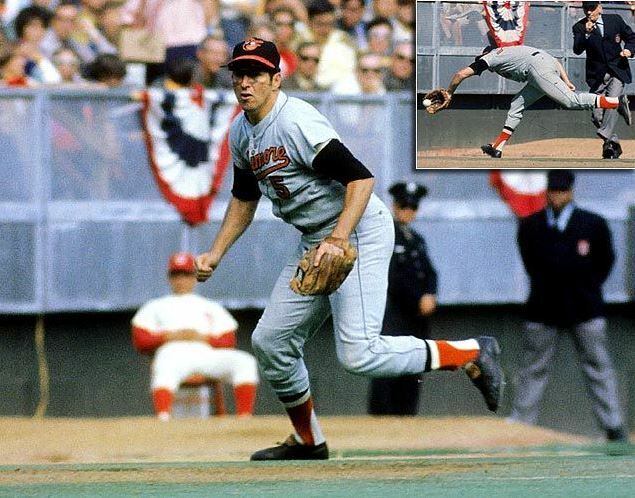 Gowdy: “Boy, that’s something you rarely see – Brooks Robinson making an erratic throw … That’s an error on Brooks Robinson. Just about every All-Star or World Series you see him in, he is the spectacular fielder of the series.” This would be Robinson’s only error, and it was a slight, but obvious, mishap – at this early stage, any reasonable person would have to say that Robinson is having a poor World Series, given that he’s 0-1 at the plate, and has made 1 error in 3 chances. Video of the play that made all of Baltimore groan. 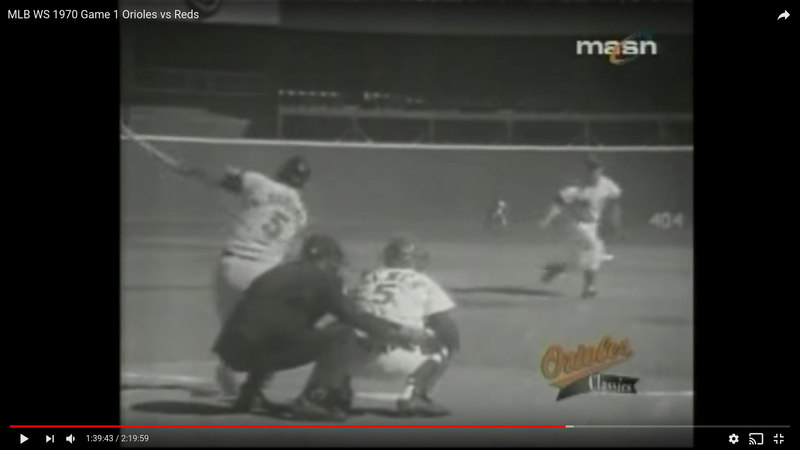 Bottom of the 2nd, Reds leading 1-0, 1 out, runner on 1st, pitcher Gary Nolan at bat, 0-2 count – Nolan lays down a gutsy, perfectly executed bunt with two strikes, causing Palmer, catcher Elrod Hendricks, and Robinson to converge near the plate. Palmer and Hendricks step aside, Robinson grabs the ball on the short-hop after it takes a wildly high bounce (it bounced off home plate), and then easily throws Nolan out at 1st. The bunt bounced so high up that there was no possible play at 2nd – Robinson recognized this, and wisely didn’t consider throwing there. The takeaway from this play is how fast Robinson charged in towards the plate – he had a habit of charging forward on every ball that came his way, and he was all over this very effective bunt. 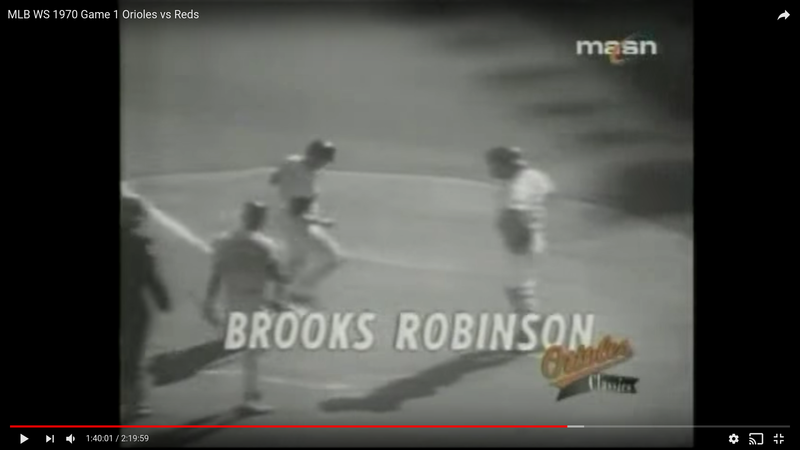 Robinson was involved in 4 out of the Reds’ first 6 outs, and it might have been to his long-term benefit that he made the error early on in the Series, as it might have shaken the butterflies out of him. Video of the play. 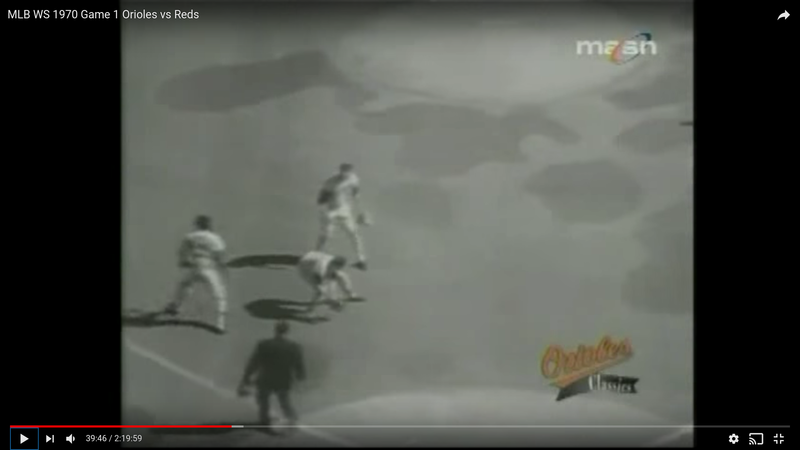 Top of the 4th, Reds leading 3-2, 2 out, bases empty, Brooks Robinson up, 1-0 count – Robinson again tops a ground ball to Tony Perez at 3rd base, this time an easy play. Video of the play. 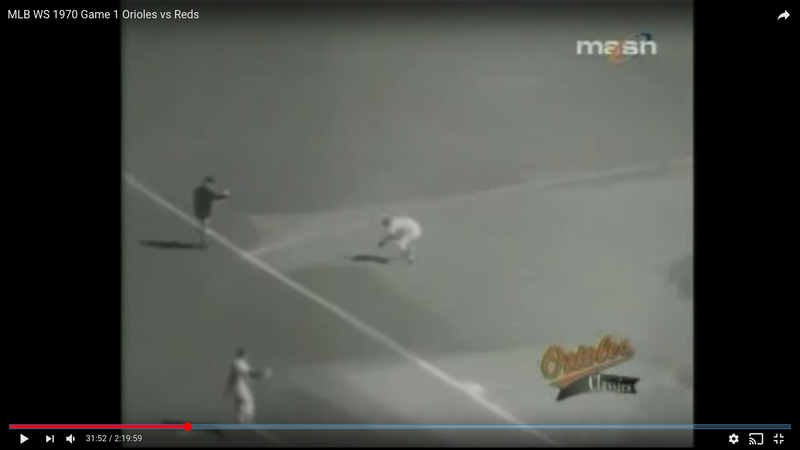 Bottom of the 4th, Reds leading 3-2, 2 out, bases empty, Gary Nolan up, 0-0 count – This is the 1st of 2 bizarre plays this game – the ball slipped out of Palmer’s hand, resulting in one of the strangest pitches you’ll ever see. I’m not sure which is more bizarre: Robinson’s error, or this pitch. I don’t want to make excuses, but is it possible that this was the exact same baseball that Robinson threw high to first base? In both instances, the ball seemed to slip in a similar way (remember, this is nearly fifty-years ago, and they didn’t use new baseballs like they do now – at the very least, it makes for an interesting conspiracy theory). Video of the play. 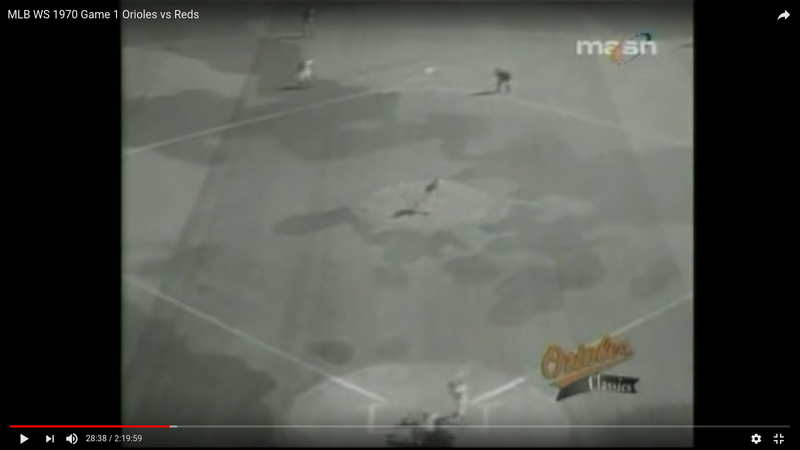 Bottom of the 4th, Reds leading 3-2, 1 out, bases empty, Woody Woodward up, 1-1 count – Mcintyre: “Kurt, Brooks Robinson at third base is fairly deep, and Woodward is an excellent bunter.” Gowdy: “Let’s see what happens.” Robinson was baiting Woodward into bunting here (Woodward was a notoriously light hitter, and there’s no way Robinson would be playing him deep), although Woodward took a full swing instead, fouling out to Powell at first base. Video of the play. 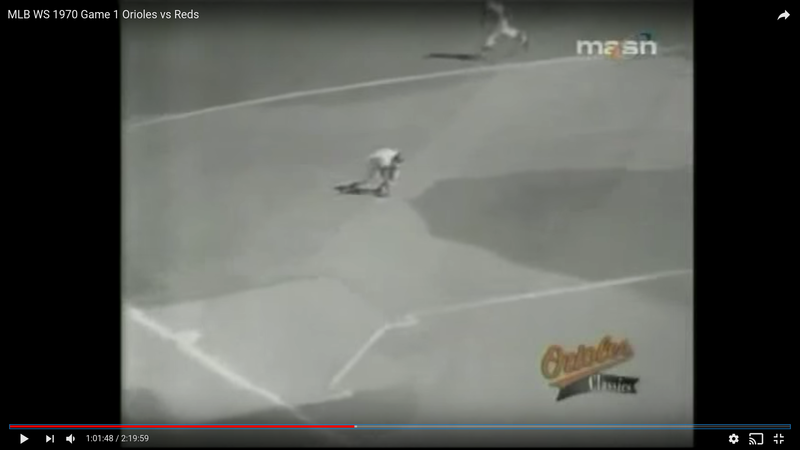 Bottom of the 5th, Tied 3-3, none out, bases empty, Lee May up, 2-2 count – This is it: “The Play.” The play that got Robinson national attention early on in this World Series, and the play that Baltimore fans had seen dozens of times before. May nailed a bullet grounder to 3rd, and Robinson went to his right, nabbing the ball just before his momentum carried him into foul territory. 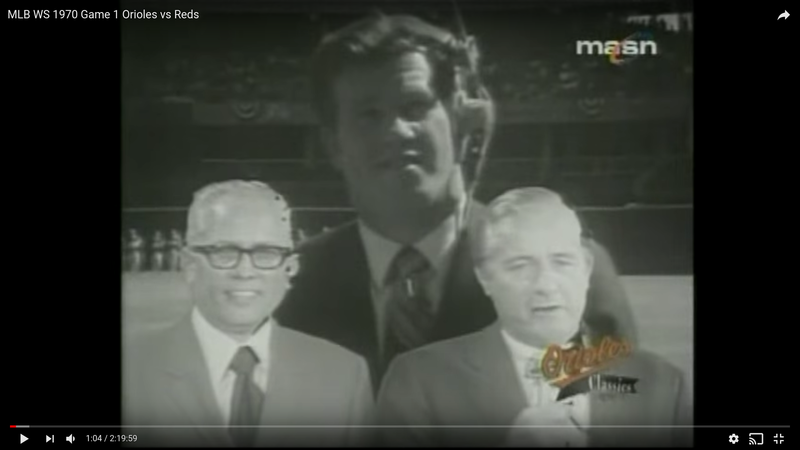 Then, with a single motion, he turned and threw a one-hop strike to Powell at first, and because of network television, Robinson’s legend went from “regional” to “national.” Gowdy and McIntyre both began yelling spontaneously, then the Reds announcer McIntyre famously (and as a testament to McIntyre, impartially) shouted: “Oh!! Great day in the *morning*! What a play!” Gowdy: “Well, he does it, in big games … Just a remarkable play, that’s one of the best plays you’ll ever seen a third baseman make in a World Series game, and he made some great ones last year against the Mets, and also against the Dodgers in ’66.” Plays are like this are why I hurried home from elementary school when the Orioles had a game, primarily to watch Robinson – I guess this is the play you’re “supposed” to watch, and because it happened in Game 1, it drew national attention early on, but even at age 9, I’d seen Robinson make numerous plays at this level, and although I remember being excited, I also remember not being surprised. Video of the play. 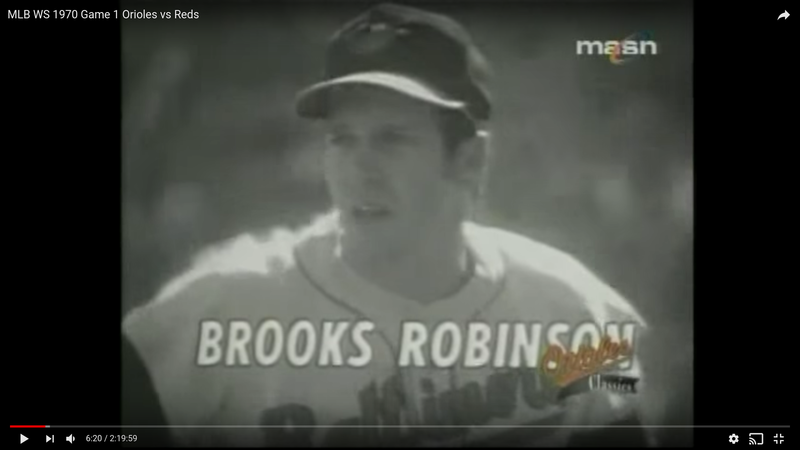 Top of the 6th, Tied 3-3, 1 out, bases empty, Brooks Robinson up, 0-1 count – Shortly after “The Play,” Robinson would put an exclamation point on his statement. McIntyre: “Here’s Brooks Robinson. 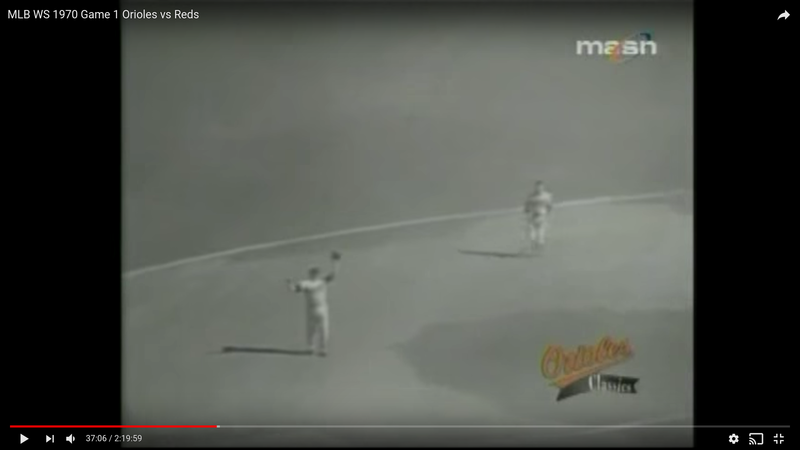 What a terrific play he made on that ground ball at 3rd base on Lee May – a major-league and World Series kind of play.” On a 0-1 count, Robinson hit a fly ball to left field. 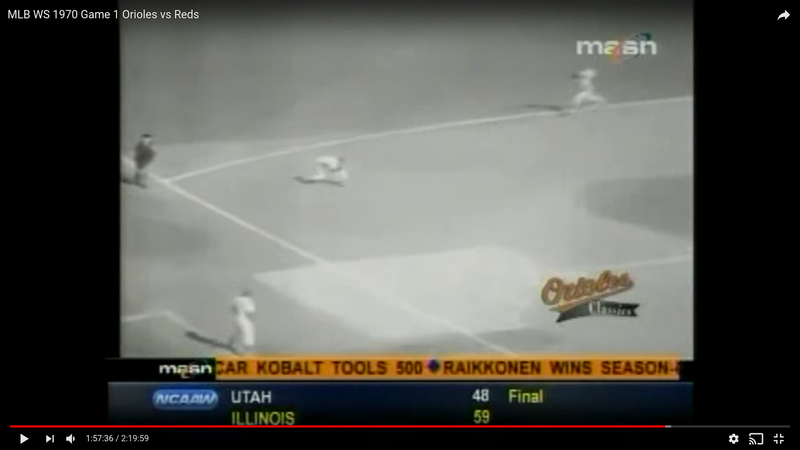 Carbo scaled the wall, but the ball was hit just a bit too far, and Robinson would hit what would turn out to be the final run of the game: a game-winning home run. Video of the play. Clay Carroll came in to relieve Nolan, and Tony Kubek did an abbreviated interview with David Hartman (this was before Hartman became more famous for hosting “Good Morning America” and starring in “Lucas Tanner”) as Carroll warmed up. Bottom of the 6th, Tied 3-3, 1 out, runners on 1st and 3rd, Ty Cline up, 2-2 count – The is the 2nd bizarre play of the game, and is best watched rather than described (this is the play when Hendricks “tagged Carbo out” at the plate). Video of the play. At the beginning of Game 2, Gowdy analyzes this unique play in detail. Video of the play with analysis. 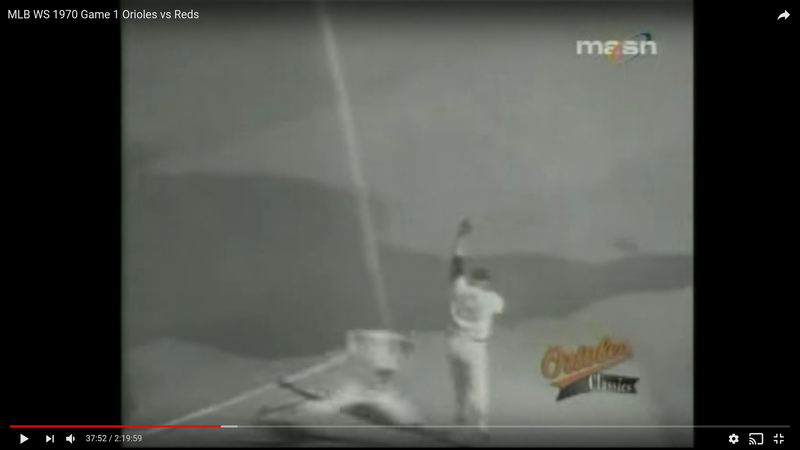 Bottom of the 7th, Orioles leading 4-3, 2 out, runner on 2nd, Johnny Bench up, 2-2 count – The 1970 NL MVP Johnny Bench, who hit 45 home runs and 148 RBIs during the season, was a dangerous batter with Tony Perez on 2nd base. Bench smacked a hard grounder to Robinson at 3rd base, and Robinson made it a routine play, throwing out Bench at 1st, and ending a somewhat threatening inning. Video of the play. 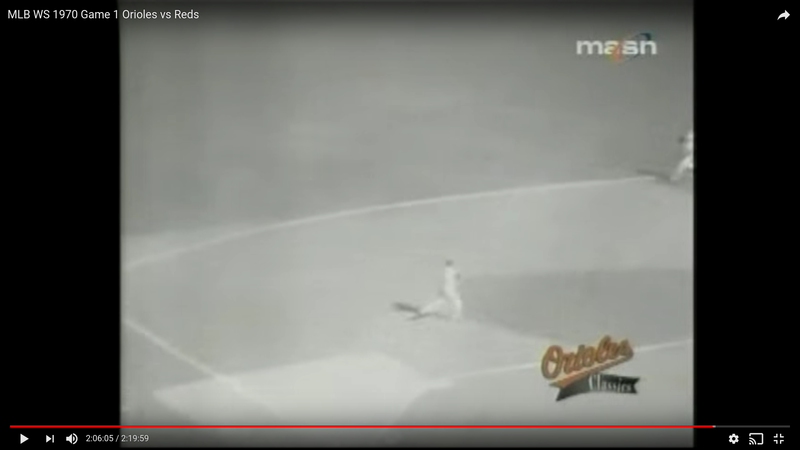 Bottom of the 8th, Orioles leading 4-3, 1 out, none on, Bernie Carbo up, 0-2 count – Bang-bang: Carbo lined out at 3rd to Robinson, who was right there, and then flipped it around the horn. Video of the play. 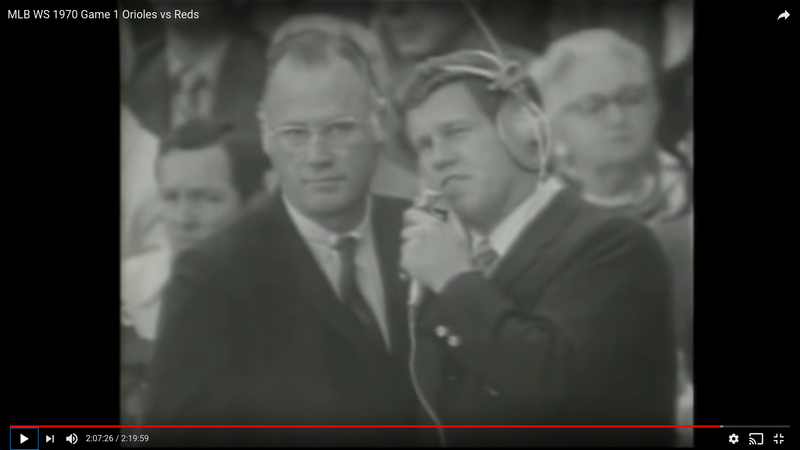 Top of the 9th, Orioles leading 4-3, none out, none on, Brooks Robinson up, 2-2 count – Tony Kubek interviews Commissioner of Major League Baseball, Bowie Kuhn. Kubek: “Mr. Commissioner, pretty good play by this fella, hitting.” Kuhn: “I tell you, it’s as good of a play at 3rd base as I’ve ever seen – I didn’t believe he could make it. And it was a very key play, because it was followed by two hits.” Video of the dialog. 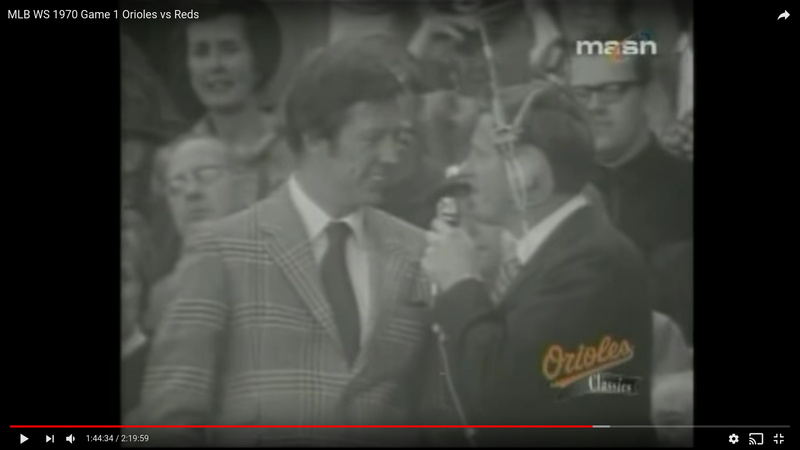 Gowdy: “And he was voted by the Baltimore fans last year as the greatest player in the history of the Orioles – you can see why, the way he’s performed today.” McIntyre: “Yes sir, Kurt – a home run, and some great plays at 3rd base.” Brooks Robinson strikes out looking. Video of the play. This entry was posted in Analysis and tagged Brooks Robinson, Defense. Bookmark the permalink.